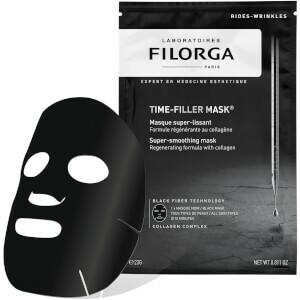 Smooth the complexion with the Filorga Hydra-Filler Mask; an effective sheet mask that works to reveal younger looking skin in just fifteen minutes. Harnessing a similar power to a concentrated serum, the face mask offers a double smoothing effect, which includes tightening and filling action. The mask is enriched with tightening actives that visibly lift the complexion, whilst natural-origin Collagen works to eliminate the appearance of fine lines and wrinkles. Utilising black fiber technology, the Hydra-Filler Mask adheres perfectly to the curves and contours of the face, which boosts the absorption of ingredients and enhances the anti-ageing effects. After opening the packet, unfold the mask and gently remove the protective mesh. Leave on for 15 minutes. Remove the mask and massage excess serum into skin with fingertips. No need to rinse. Application to be renewed 1 to 2 times per week.